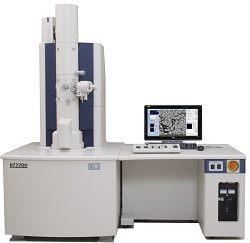 A NEW objective lens option and a new scanning transmission electron microscope (STEM) version makes the Hitachi HT7700 the most powerful 120kV TEM currently available, says the company. The instrument is now suited to low accelerating voltage, high resolution examination of engineered light element materials, as well as the biomedical imaging for which it is already known, it adds. The new high resolution pole piece option for the HT7700 utilises Hitachi’s unique double-gap objective lens technology, together with minimised spherical aberration to provide enhanced resolution – described as best in class for a 120kV instrument. This makes it especially suited to high resolution imaging of light element materials where lower voltages provide improved contrast and reduced damage. Exceptional imaging is said to be possible even at voltages as low as 40kV. The HT7700 offers fully digital imaging, with a wide range of CCD camera systems available. All microscope operations can be performed through the graphical user interface, including setup, alignment, image adjustment, and image acquisition. The new STEM option further enhances the analytical capabilities of the HT7700, says Hitachi High-Technologies. This integrates seamlessly with HT7700 operation and provides powerful brightfield and darkfield imaging. The high magnification and large field-of-view STEM is said to be ideal for high-resolution lattice imaging, bulk crystal structure, and nanoparticle analysis. Analytical imaging and thick section analysis are now made routine, the company says, and all STEM images are instantly archived in Hitachi’s EMIP database software.